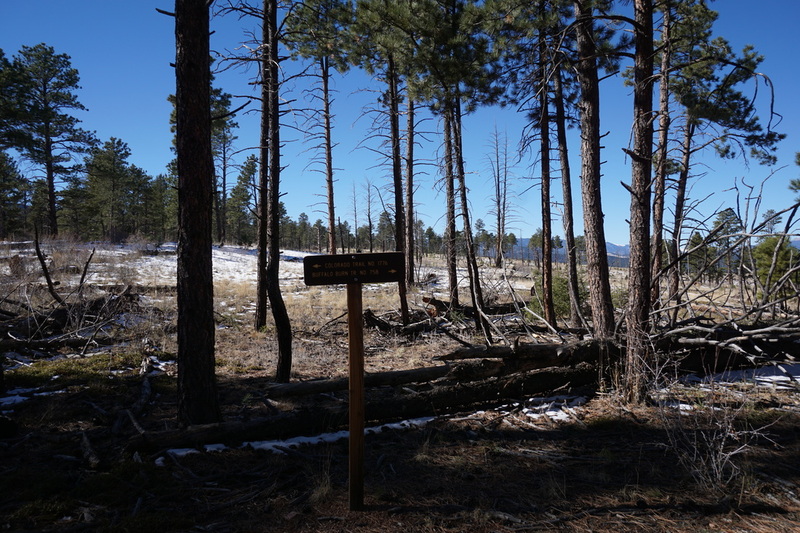 Directions: From Denver, take Hwy 285 south to Pine Junction and turn south on 126, Pine Valley Road. 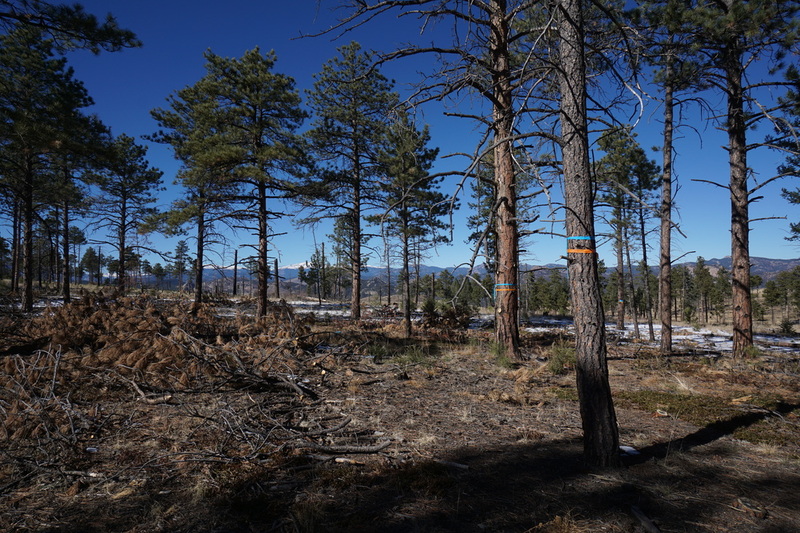 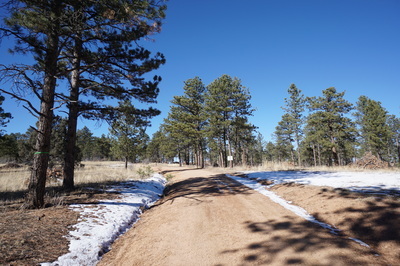 Follow 126 south through the towns of Pine and Buffalo Creek to the trail crossing for the Colorado Trail. 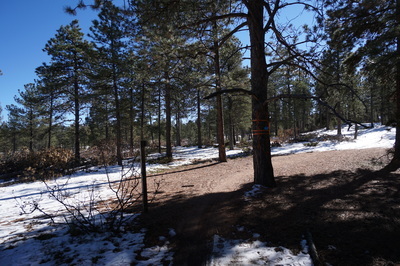 Park on the west side of the road just before the gate. 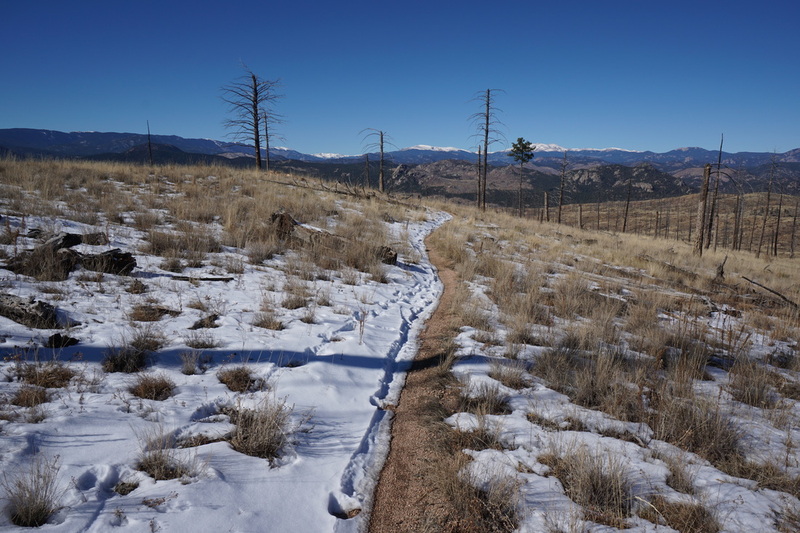 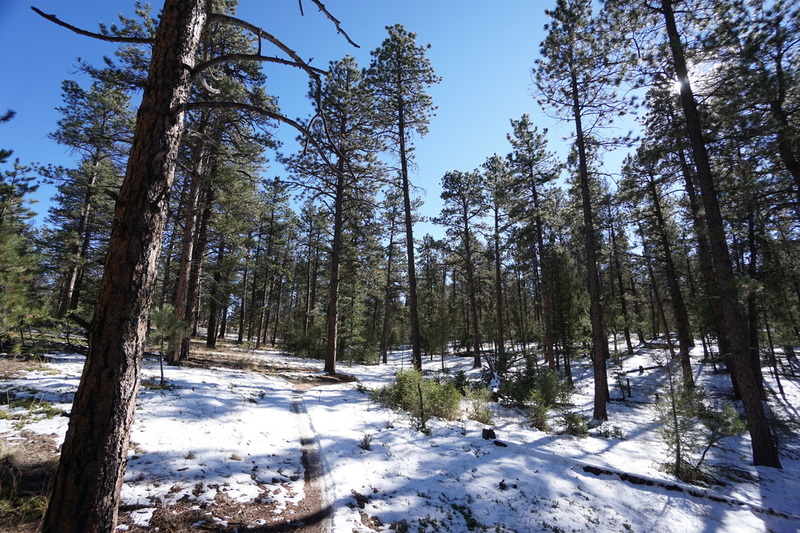 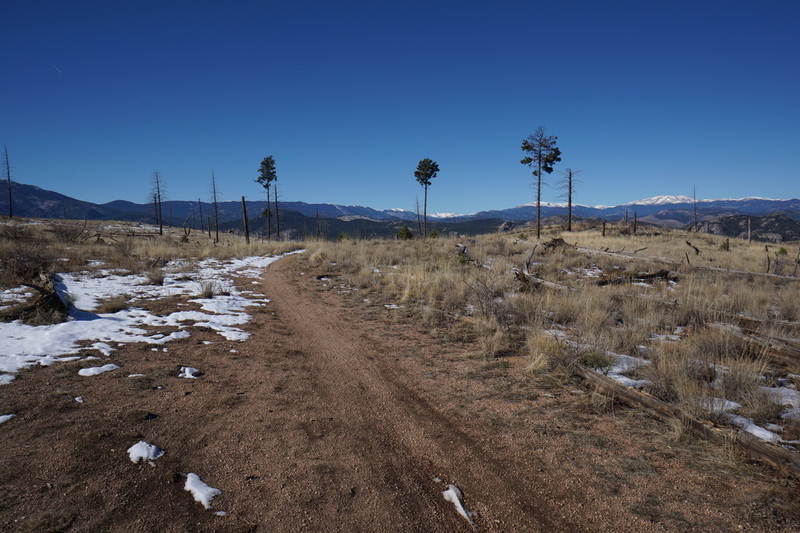 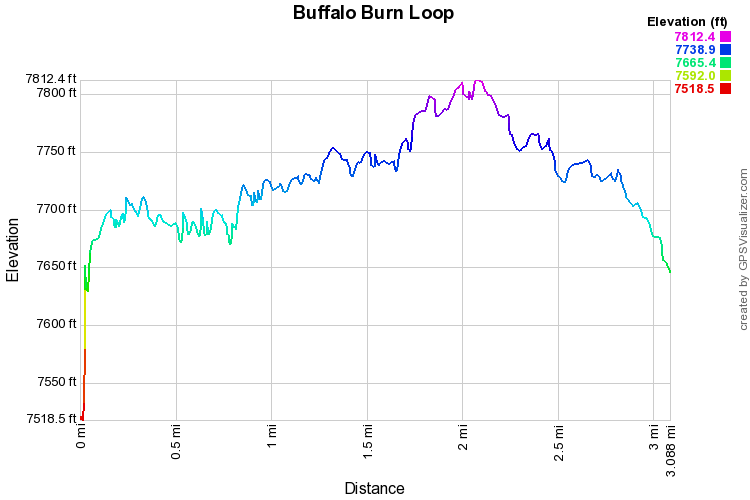 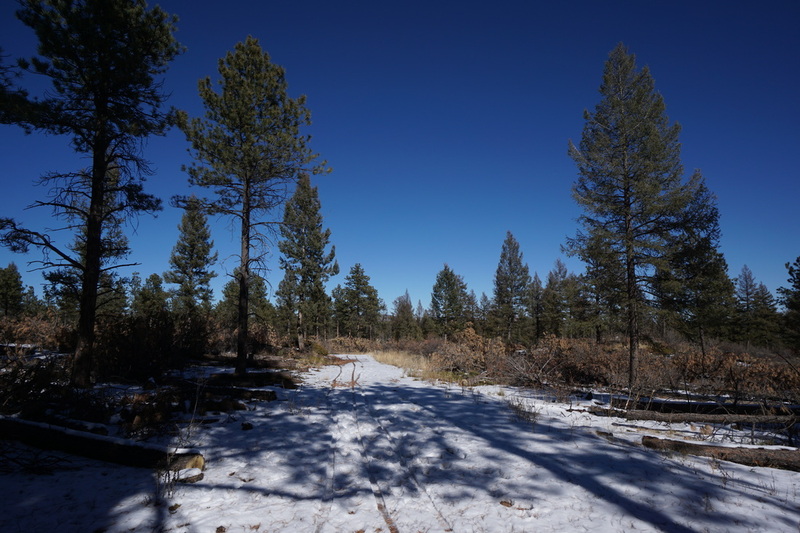 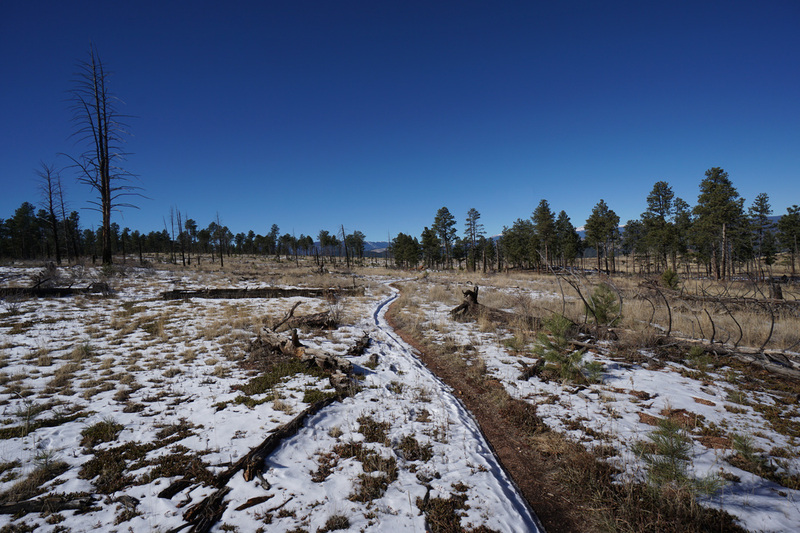 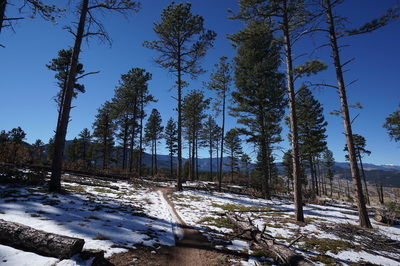 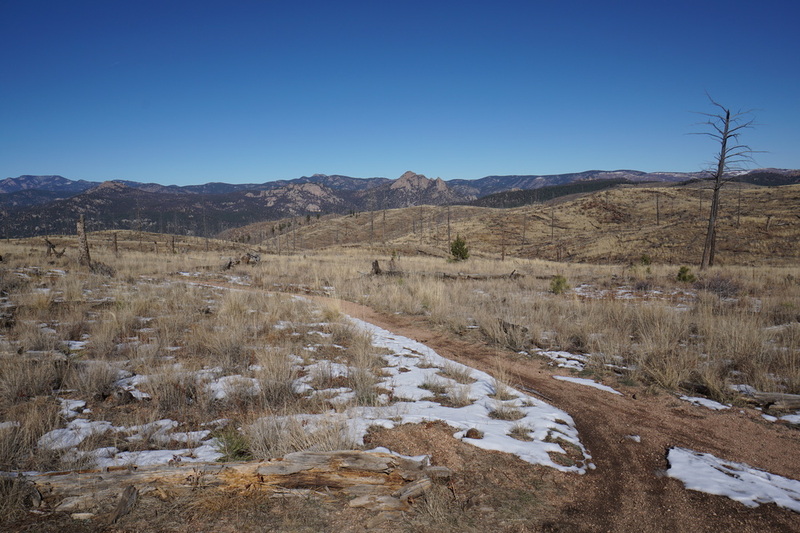 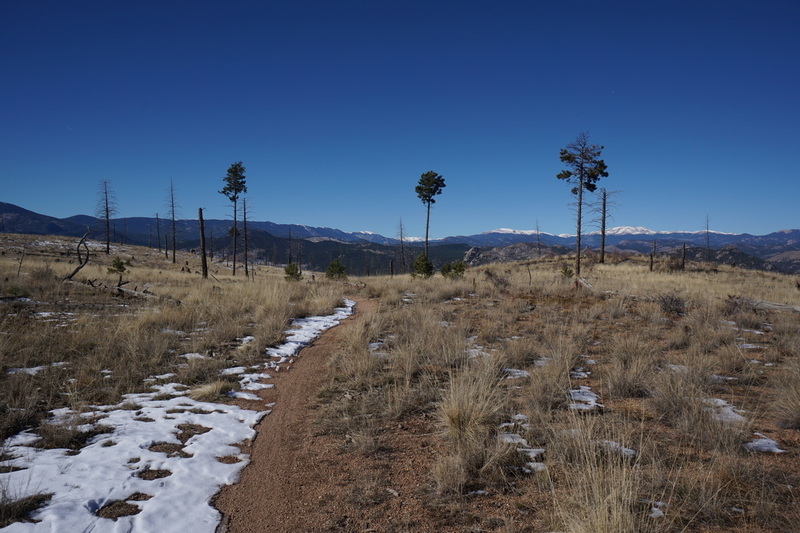 The Buffalo Burn Loop is a quick and easy 3 mile loop in the Buffalo Creek Recreation Area. 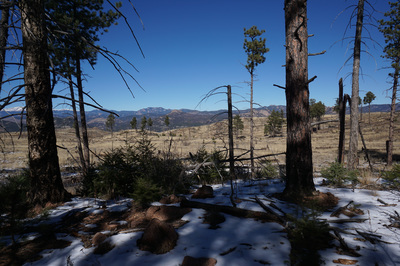 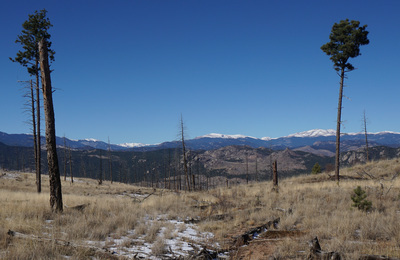 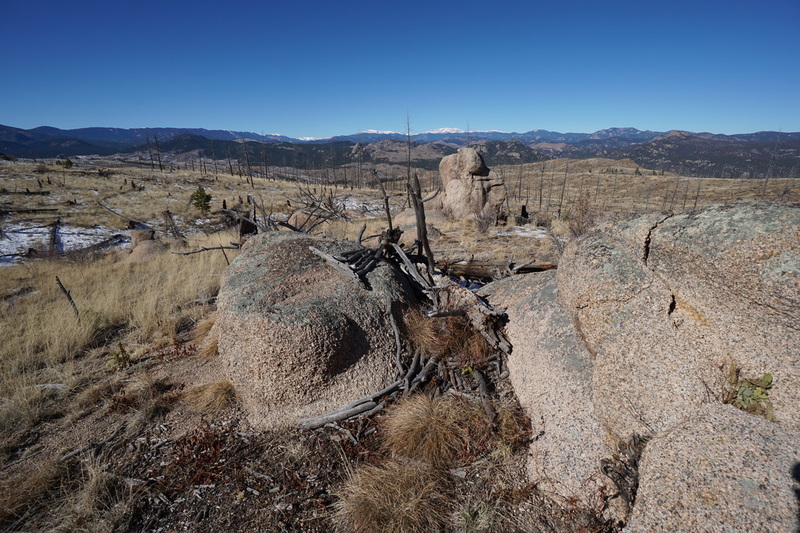 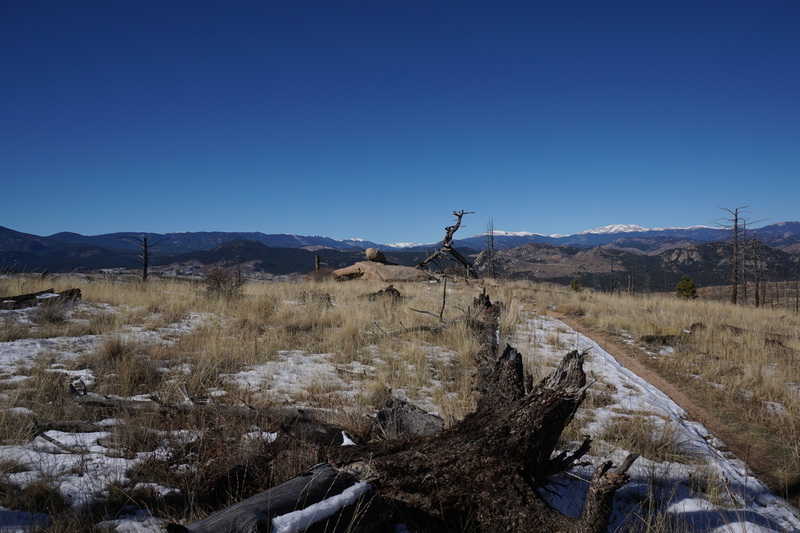 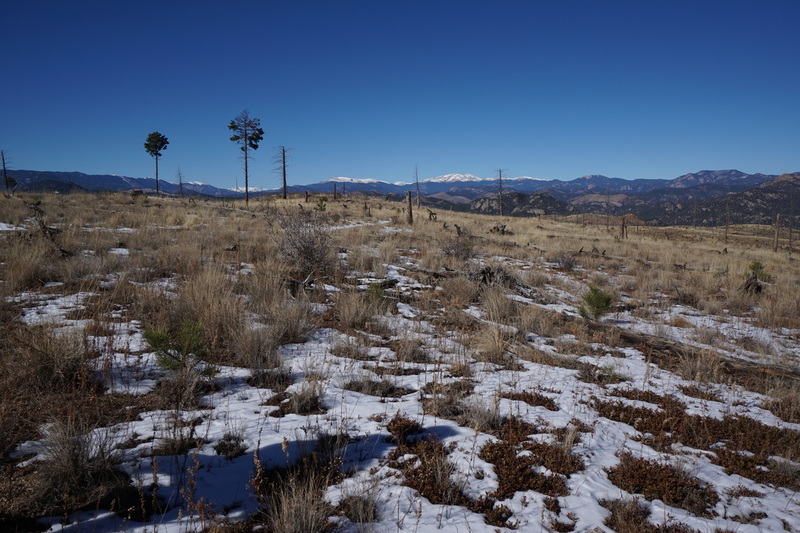 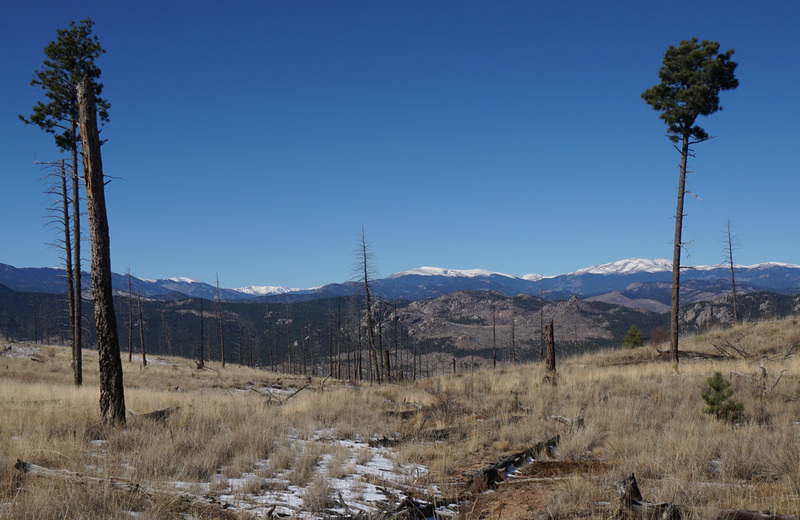 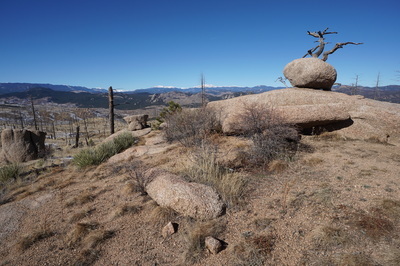 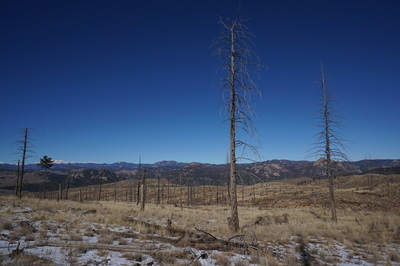 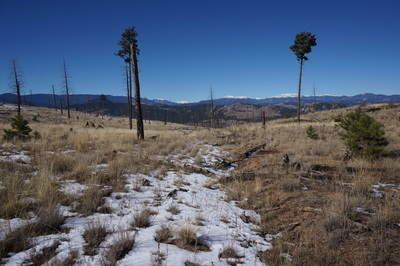 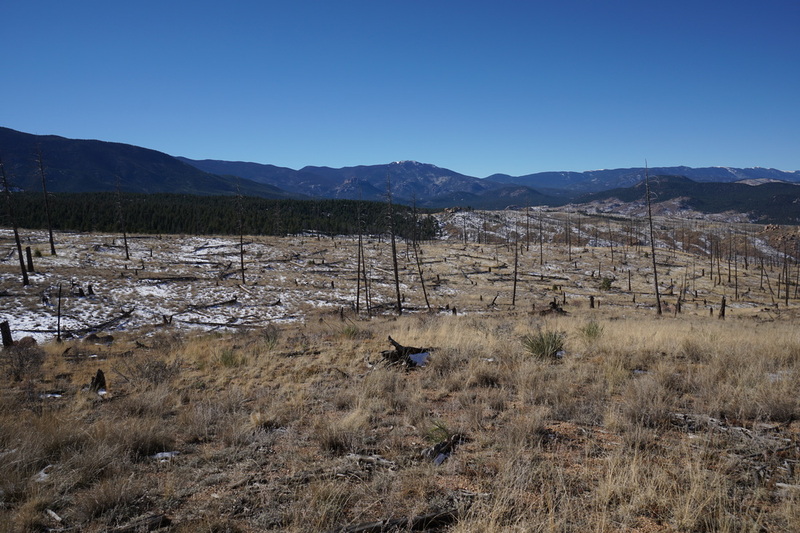 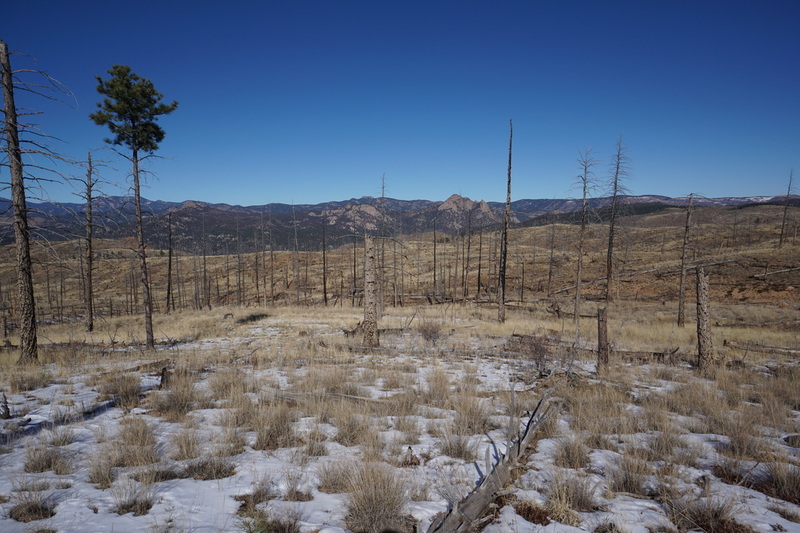 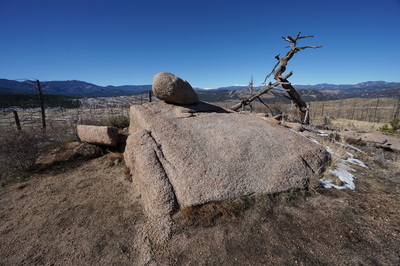 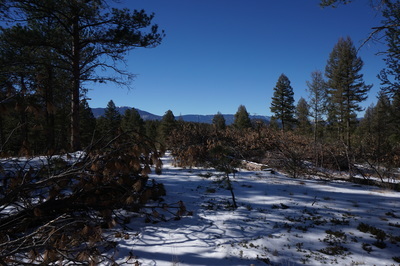 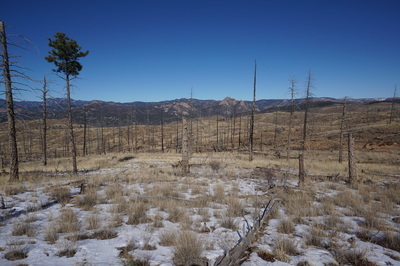 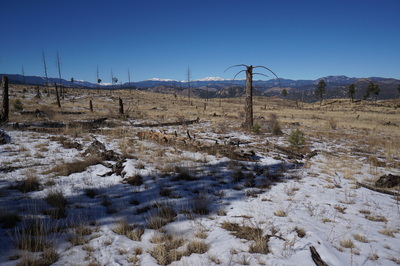 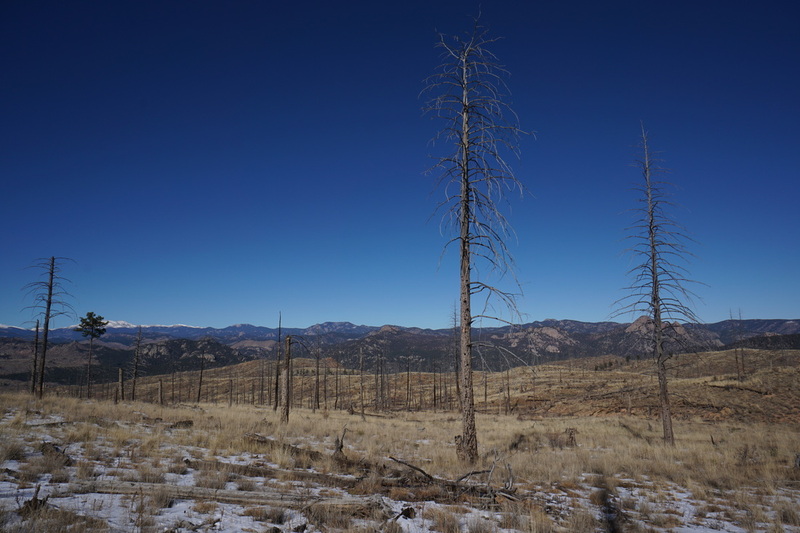 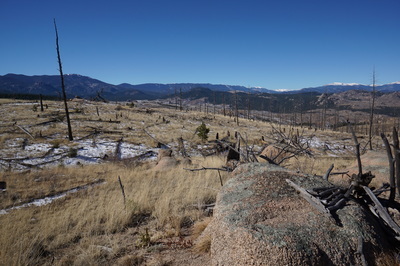 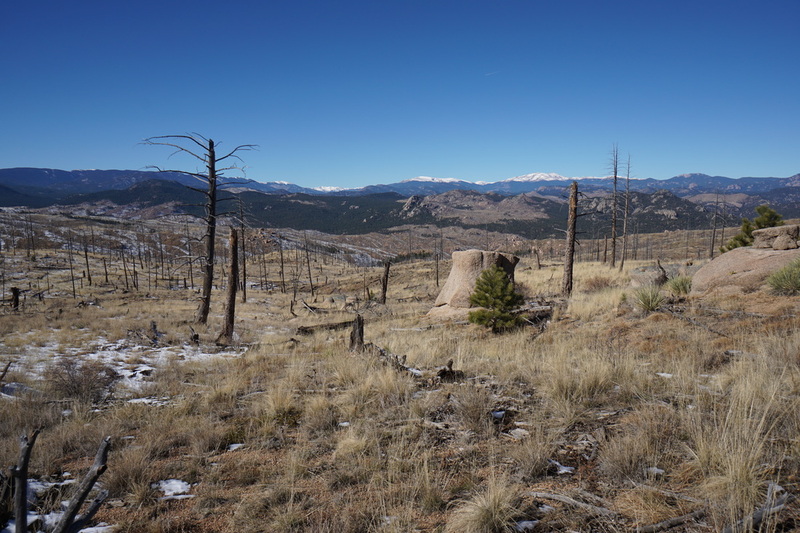 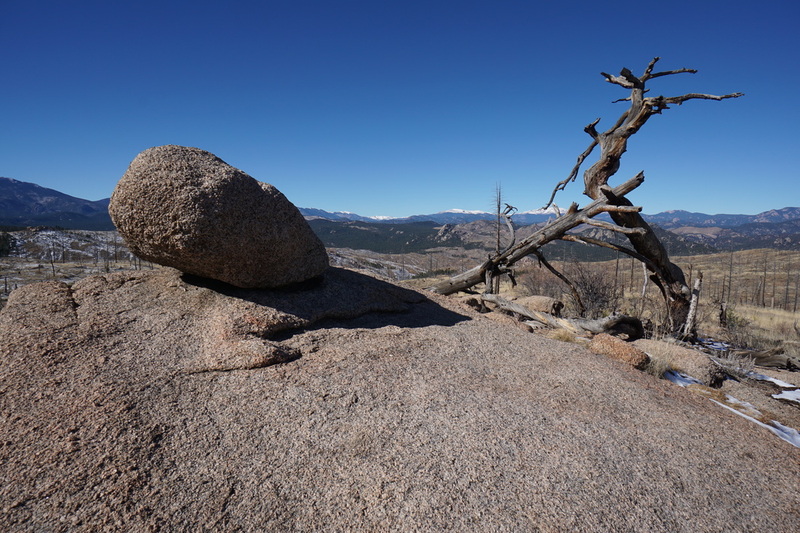 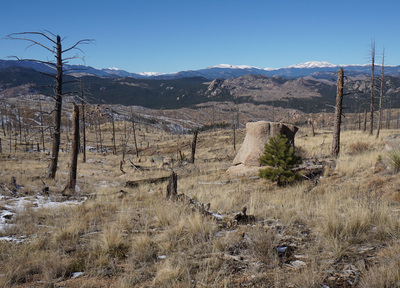 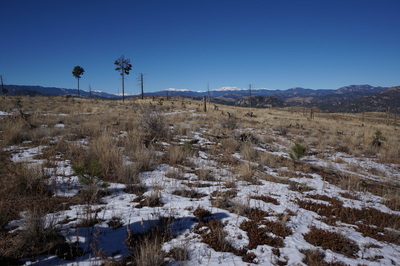 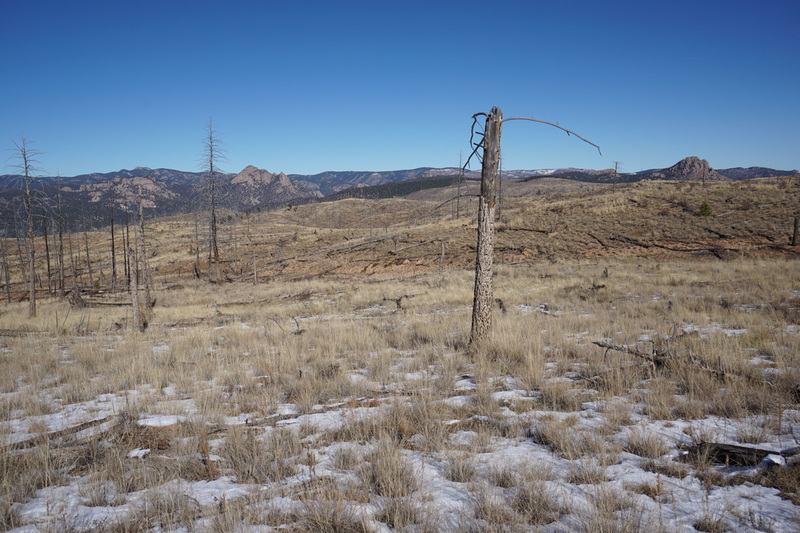 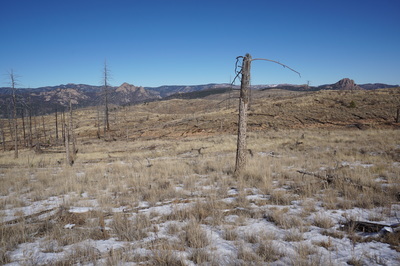 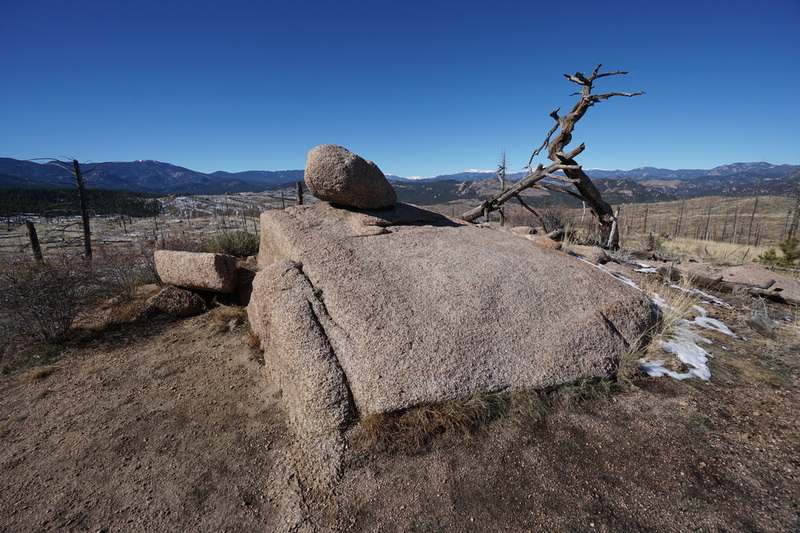 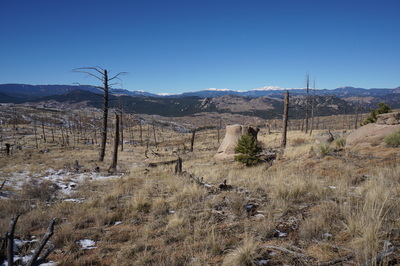 The hike provides a quick taste of the Buffalo Creek wildfire recovery area with fantastic views of the nearby rock formations and snowy peaks in the distance. 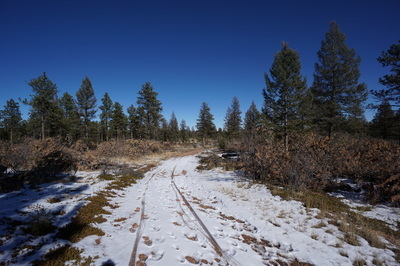 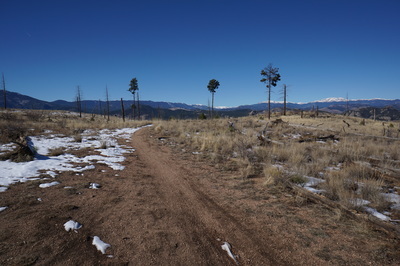 The trail begins along a dirt road that serves as the Colorado Trail in this area. 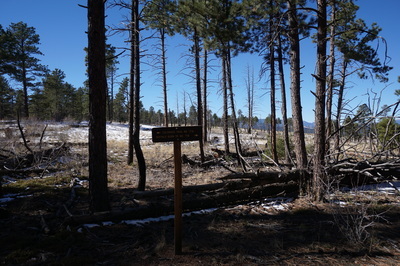 At the first trail sign turn right and follow the Buffalo Burn Trail out of the forest and into the burn area. 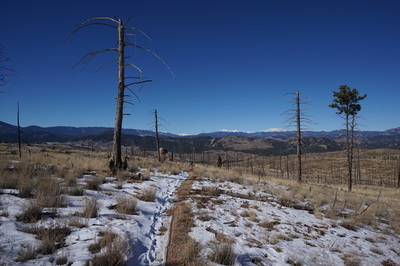 From here you enjoy the views as the trail winds around the rolling terrain through burnt trees. 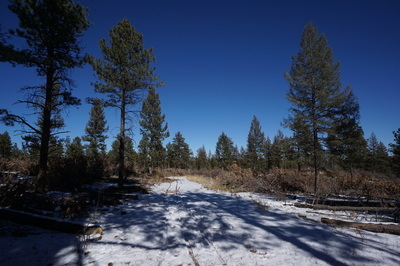 In the spring this area is highlighted by green grasses and wildflowers but in the early winter the trail serves as a respite from the snowy forests nearby. 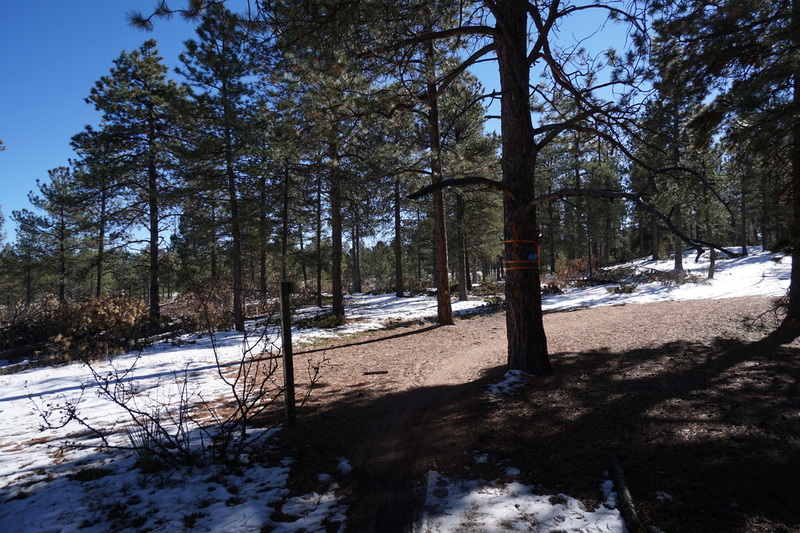 After about a mile, the trail re-enters the forest for the remainder of the trail. 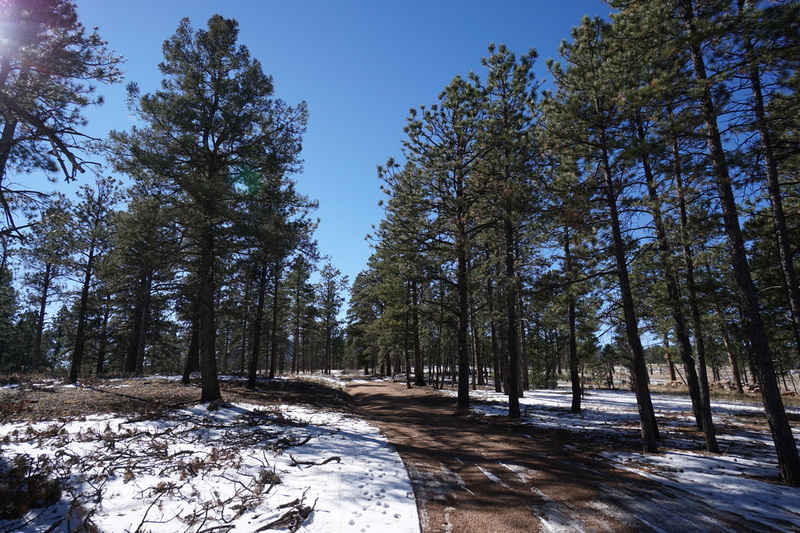 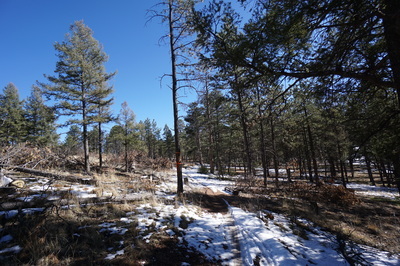 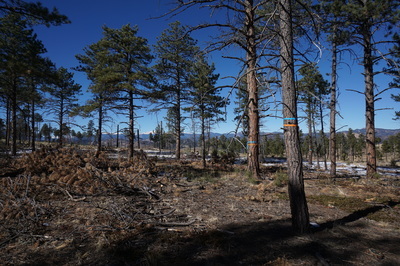 The trail winds through the pleasant quite forest for another mile and rejoins the CO Trail at the 2 mile mark. 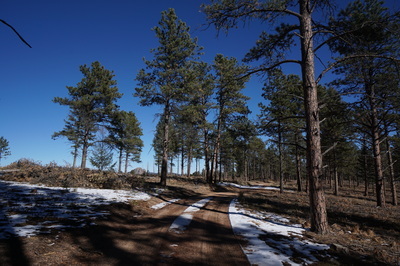 Turn left here and follow the wide road/trail back to the beginning. 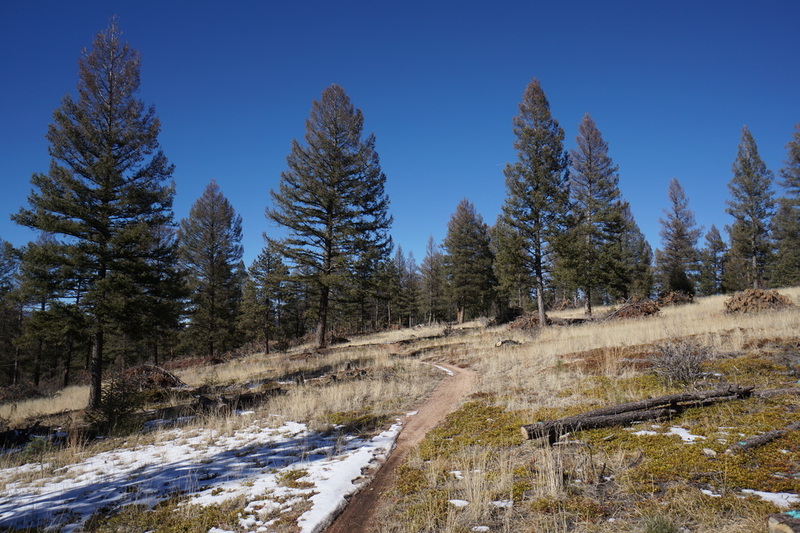 All in all, this is a wonderful hike but be aware that it is mostly used by mountain bikers so keep an eye (and ear) out around the curves.